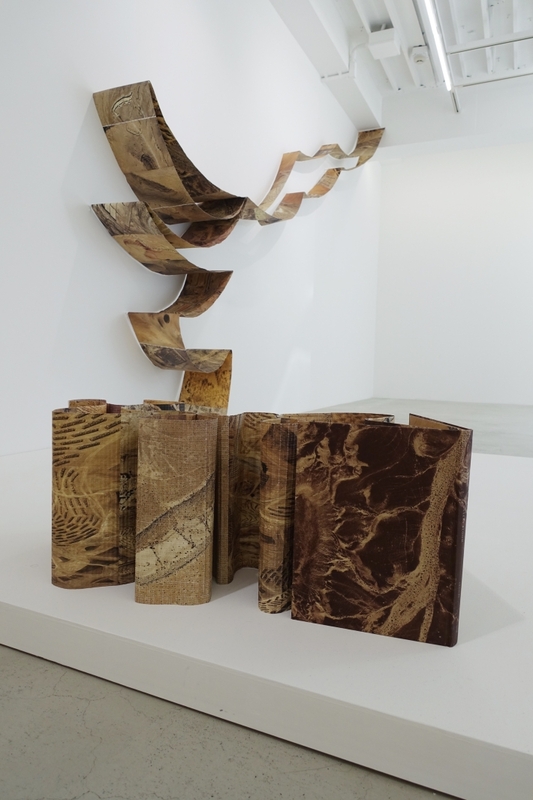 "the fold-Desert Bloom: Fazal Sheikh" 2016　Cut on a book "Desert Bloom"
MAHO KUBOTA GALLERY is delighted to announce an exhibition of new works by Noriko Ambe. New coordinate axis for perception is produced by cutting into sheets of unblemished white paper and stacking the sheets together. Mysterious fluctuations in focus are revealed by making deep cuts in an existing book or text. 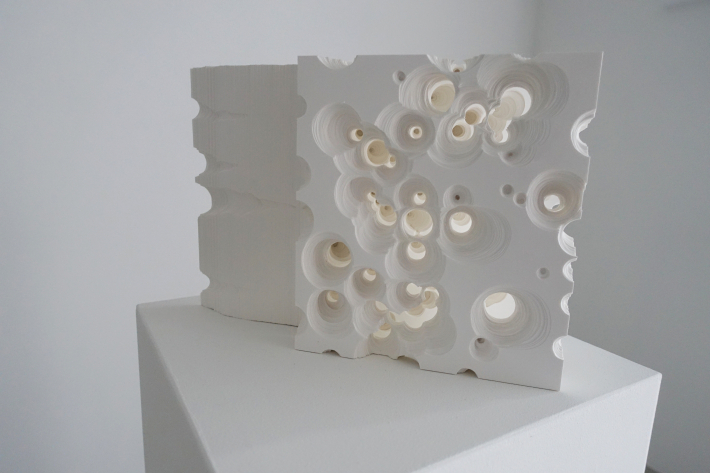 The physicality of Noriko Ambe’s manual process, acting as a horizontal axis, combines with a vertical axis spun from her unique narrative to make her paper sculptures very special indeed. Since setting up a studio in New York in 2004, Noriko Ambe has made America her base, but continues to exhibit in museums and galleries internationally. Her works feature in a number of prominent collections, including the Whitney and MoMA in New York. Ambe is particularly well known for the cutting project that she began in 1999. She creates cutting project works by making precise cuts in individual sheets of paper with a very sharp blade, then stacking hundreds or sometimes thousands of the sheets together, so that thin sheets of paper existing in barely more than two dimensions are transformed into solid works with a gratifying three-dimensional presence. Her representative work includes the Flat Globe series, in which she makes careful cuts in crisp, bright-white Yupo paper, stacking the sheets together to create cubic sculptures large enough to need two hands to hold. As hundreds of fragments—each only a thin piece of paper—build up layer after layer, the edges create elegant and beautiful curves that acknowledge each other’s presence, resonating with time or generating a series of variations to create a landscape that seems like a part of the earth seen from the sky above. The layers occupy the time axis, and the form produced as the layers build up over time seems to conceal within it signs that something will emerge from this sequence that does not have a narrative. These small solid forms seem to carry an inherent energy. As if giving off light from deep from inside, they assert an alluring presence that quietly enchants their viewers. 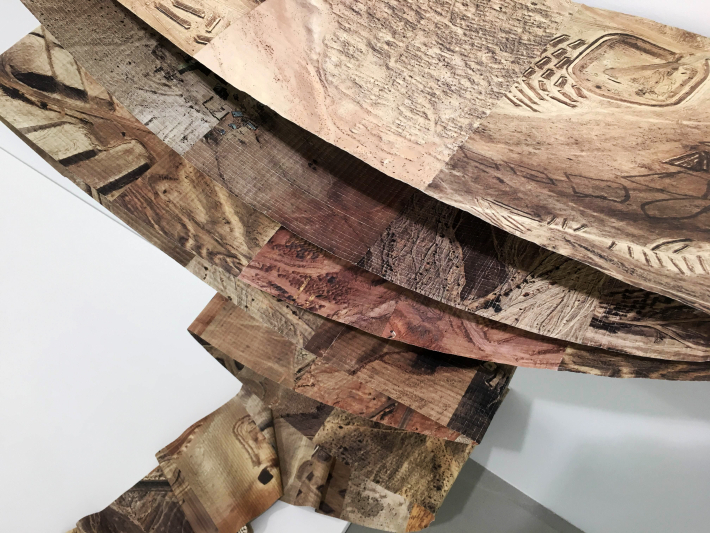 This show, “Continuous Cutting Altered Daily” features about a dozen new sculptures that Ambe created in her New York atelier over several intensive months. 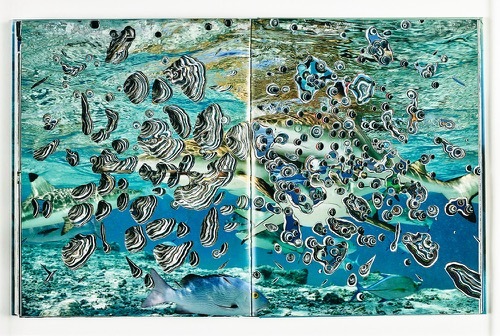 In addition to her signature white paper relief works and cubic works, the exhibits include three new works in her book series. With an encyclopedia, she expresses the surprise of coincidence encountered when wandering through the forest of words that cover the pages. Working with a Mapplethorpe collection book, she carefully deals with the issue of censorship that artists face from time to time when using their bodies as media. And with a book of Fazal Sheikh’s aerial photography of a desert area in the Middle East, she focuses on the current tension between the Islamic world and the non-Islamic world. 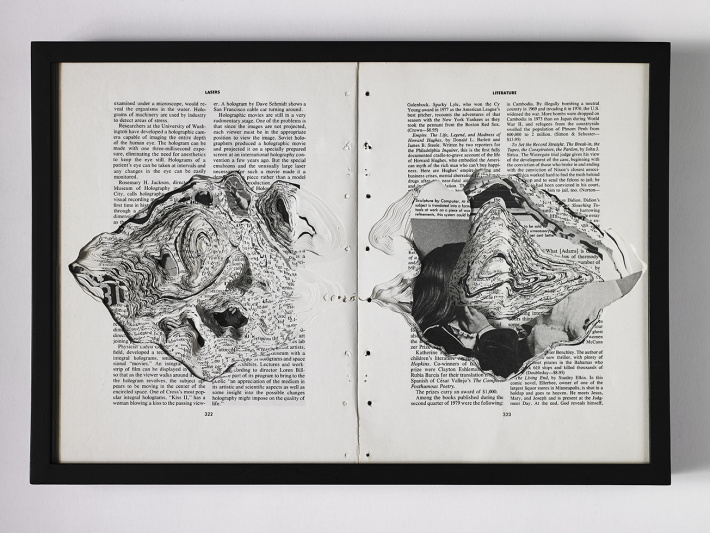 In each of these three projects Ambe uses her unique vision and perception as a compass to transform books into visual forms that incorporate eye-popping power of imagination. In presenting this group of works that took a vast amount of time and effort to take shape as the artist addressed these stoic materials, the exhibition takes a leap forward in communicating the artist’s resolution and involvement in society.